The 42nd session of the UNFCCC (United Nations Framework Convention on Climate Chance) Subsidiary Bodies opened in Bonn, Germany. The main task that lies in front of the negotiators is to simplify the agreed-upon text of the agreement due to be adopted in Paris, later in December this year. In Bonn, the scope of work will include meetings of contact groups, as well as informal consultations. The main point of the agenda for the current session is to simplify the draft text of the future agreement. Apart from that, meetings of technical experts whose work is focused around renewable energy development and increasing energy efficiency of urbanized territories will take place in Bonn. Parallel to all the above, the review process of country reports is on the schedule. The draft text of the new “Paris” agreement was made public in February 2015 in Geneva, Switzerland. According to the observers, the present agreed-upon version of the draft contains clearly defined outlines of the international actions needed to protect the climate. 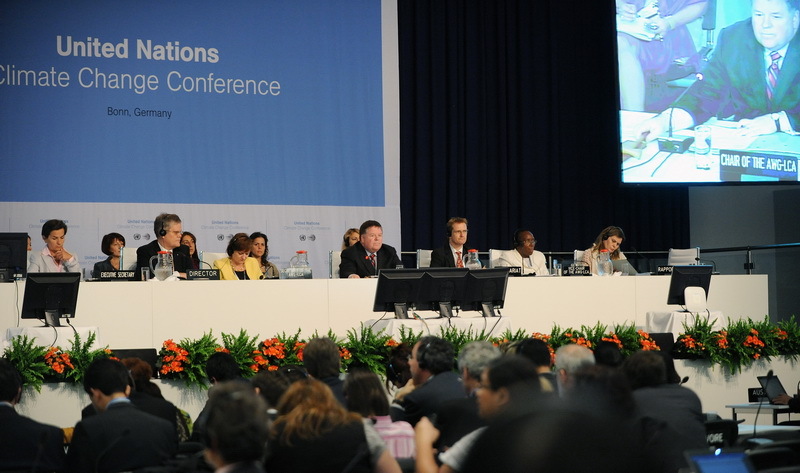 Previously, the provisional text of the agreement was adopted in December last year, at COP20, which took place in Lima, Peru. During the Geneva session in February, numerous options and additions were made to it. The very text consists of around 90 pages in small print, that are full of contradictory options, repetitions and options that do not agree with the principles of the new agreement, that were agreed-on earlier. This sort of inconsistency is not catastrophic, experts say, since it is a workable, unified and officially adopted negotiating text, there is nothing to be added to it, just removed and simplified. Previously it was expected that the agreement would only define the principles and the overall structure of global actions, and not contain any national commitments. However, in Geneva the countries decided that the agreement is to set long-term goals for countries to present their national climate-related goals. While the specific goals in question are most likely to fall outside of the agreement, the mandatory character of their adoption of the national level and submission to UNFCCC will be sealed in the final text. The agreement to be adopted in Paris is supposed to define not only the principles for common actions, but also the process of reviewing numeric values of national actions every 5 to 10 years. So far, these values were defined as INDCs (Intended Nationally Determined Contributions). The contributions should at least include numbers related to GHG emissions, in format that is defined by an individual country. Submissions that include absolute values and cover an entire national economy are preferable. However, it is also possible to submit data on adaptation and finance. The legal status of the new climate agreement has not been defined yet. This is often referred to as “The US problem”, since the country, which is the number two global GHG emitter, presents a huge obstacle to the ratification of the agreement. It is the US who is against the mentioning of any specific numbers that relate to countries’ contribution to emissions reduction. Judging by joint statements of China and the US, the two largest emitters have already agreed on all main issues, experts say. However, the EU and Russia still insist that the to-be ratified agreement include a table with specific contributions to emissions reduction. There are serious doubts concerning the possibility of reaching a goal of 2 degrees Celsius as the result of all anticipated commitments by Parties. As of now, the global emissions dynamic corresponds to the 3 to 4 degrees trend. However, many observers at the negotiations note that from session to session more and more attention is paid to adaptation issues. While, according to some experts, the currently available draft agreement text is much weaker that it can possibly be, the very fact of its existence in the approved form is viewed as positive, since it means more chances that the deal will be sealed in Paris. It is awaited that the Bonn session result in a simpler, more detailed and workable negotiating text, as well as a better outline of solutions to the issues to be discussed during the transitional period before the new agreement comes in full force. The observers and experts hope that the can-do attitude of Geneva will be kept in Bonn, and this way one more concrete step towards Paris is made.